Mumbai is an incredible city in the state of Maharashtra that many want to be a part of. Being the economic capital of the country today, there is so much to Mumbai other than what meets the eye! From art and architecture, to cinema, music, historical landmarks, education hubs, career opportunities, modern-day living and more, Mumbai is by far the best city in India to live in. Today, everybody loves Mumbai and the reasons are many. Known as the ‘City of Dreams’, Mumbai has turned to dreams of many individuals from different walks of life into reality. This is one city that provides equal opportunity and options to one and all. With a number of MNCs and corporates throughout the city, job opportunities in Mumbai are plenty. In Mumbai, you can get to any place at any time! Although you are bound to find a fair amount of crowd almost everywhere, the transportation options are many. It all comes down to where you want to go and how fast do you need to be there. Mumbai is popular for its wide range of street food that is simply impossible to find in any other city. This city is where you will find cuisines from around the country and the world at a price that is light on your wallet. If you are looking out for a fast paced life, Mumbai is where you should be. Yet, this city also offers a calm environment and places like beaches, parks, cafes, etc., where you can unwind and relax. This city has something for individuals of every mood! Known as the ultimate place to party, Mumbai is a city where the party never stops! From clubs, pubs, resto-bars, lounges and more, this is a city where you can find it all. In fact, Mumbai has made headlines for its amazing nightlife and when you need to get home, there is always a mode of transportation at your service. When looking out for a new home in Mumbai, selection the right residential space is very important. 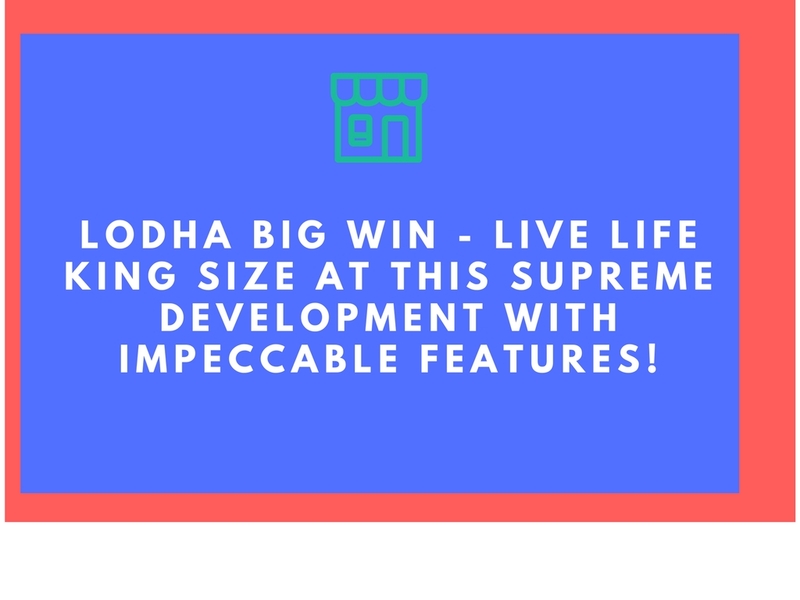 Lodha Big Win is an incredible development at Jogeshwari, Mumbai by Lodha Group that you definitely consider. This development is spread over 5 acres and contains elite towers (G +22) that offer variants of 2BHK, 3BHK luxury apartments with carpet areas starting at 631 sq. ft. and going up to 1289 sq. ft.
A projection of pure luxury, this development offers a wide range of internal and external amenities that are crafted to perfection! The apartments are high on space and contain lavish fittings & fixtures, premium flooring, fancy kitchens, safety features and so much more. The external amenities at this development include a swimming pool, café, gymnasium, multipurpose hall, Ganesh temple, picnic area, tree-top walks, landscape garden, swift elevators and 24x7 security with video surveillance. Starting at a price of Rs.1.64 Cr. only, an apartment at this development is definitely worth a buy for a modern-day lifestyle. Lodha Xclusive is another extravagant residential project at Parel, Mumbai by Lodha Group that offers variants of 2BHK and 3BHK apartments with carpet areas starting at 650 sq. ft. and going up to 1050 sq. ft. This development is well-endowed with high-end luxury from head to toe! While the apartments are built for a king, the external amenities include clubhouse, multipurpose hall, gym, swimming pool, sports facilities, fast lifts and security that meets international standards. The apartments at this development start with a price tag of Rs.3 Cr.